This was our first Halloween with a baby brother so I tried to think of a "duo" costume where my 4 year old daughter could be something "bigger" and our 2 month old son could be something "smaller". Thus, the idea for a Miss Piggy / kermit costume duo was born! 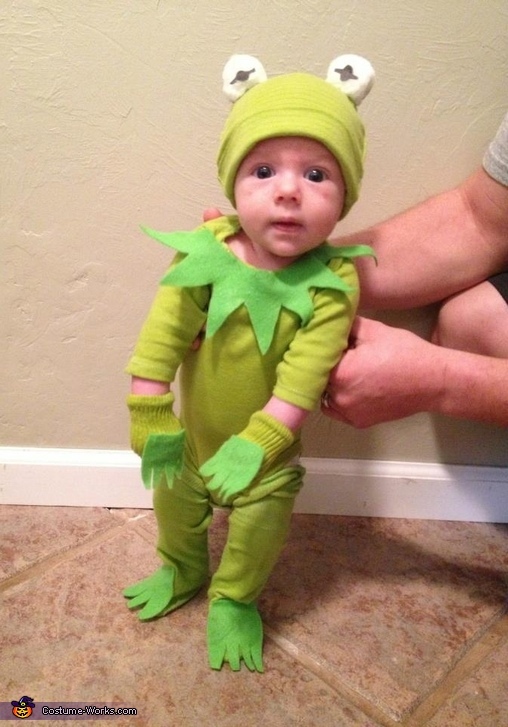 I scoured the Internet for "purchasable" costumes but the smallest Kermit costume was 12 months & i knew it would swallow our newborn & require lots of sewing. it was also pretty expensive so I decided to make it myself. I also searched for onesies & pants that were already solid green but couldn't find anything! So I realized I had all of the supplies in white I just needed to dye them. This was my first experience with clothing dye & I have to say it was super easy & I was very pleased with the results! I simply died all the pieces so they would be the right color then cut out the neck detail & hands & feet out of the felt. I used my old dress socks as the legs only because I couldn't find white pants his size to dye. I cut his baby socks to use as fingerless gloves. I got glued the hands & feet to the socks & the neck piece to the neck of the onesie. Then I took the large cotton balls & hot glued cardboard in the correct shape to make Kermit's eyes (actually I drew the shape of Kermit's eyes onto the cardboard packaging that the cotton balls came in with a sharpie & cut them out). Then hot glued the eyes to the beanie & voila! This was a Suuuuper easy, suuuuper comfortable & suuuuper cute costume for a newborn! He was warm & comfy & the impact was huge! We got tons of compliments. Plus our little guy seemed to really love it! He would smile every time we put it on! This is so adorable!!! Thanks for the amazing idea. Love Miss Piggy too. Where did you get the neon green fabric dye? The color is perfect, and in my experience, fabric coloring doesn't always turn out right. Where did you get the cotton balls??? Thank you for sharing this. I was able to make a kermit costume for this year's halloween. And since my son is kermit, I decided to be the Miss Piggy. Everything turned out well. Question...where did you find a small wig to fit your little girl?